Our first date was in November 1998, almost 15 years ago. I don’t feel any different than I did that day. I am still painfully and terribly in love. I know him better now, but I still feel like the 19-year-old starry-eyed Virginia girl in love with the 18-year-old Italian/Iranian ringlet-ed boy. We fell in love in a nursing home when we were about 14 years old. Who can say that? Just a handful of people in the whole world? Our private school was located inside a wing of a working nursing home. We had pull-cords in the bathrooms and, if you were lucky, your locker was a kitchen cabinet. If you weren’t, it was a bathroom counter. We spent a little time in the cedar-closet darkroom, too. Ahem. Our first date wasn’t until we had gone to college, 440 miles apart. When he came home for his first school break, we went on a date. I like our first date story better than anyone else’s. We went to Ruth’s Tea Room. Ruth’s Tea Room (or tear room, as he says) was just a tiny little place inside an old woman’s house in Winchester, VA. I guess only locals knew about it. There wasn’t even any sign out front by the time we came around. Remember, there was no internet to speak of in 1998 – at least not for me. And not one that would spread the word about such an establishment. She served cakes and tea and homemade lemonade with sugar around the rim of the glass. She probably served meals, too, but we were always too poor to buy much. I remember the dim lighting. I remember the jukebox – with a lot of Duke Ellington and Tina Turner and… hmm, maybe not any white singers at all! I remember, above all else, the velvet red wallpaper. I remember his black eyes staring at me. I had been to Ruth’s Tea Room with my best friend, Sarah, many times. We were just poor punk/goth/hippie kids who dressed from the thrift store. (Don’t let the private schooling fool you- I was sent there by a well-meaning relative.) The proprietor, whom I wrongly assumed was Ruth, was old and kind and Southern and genteel. She seemed to welcome us teens. Who, in their right minds, provides a place for teens to go, late at night, and somehow convinces them to use manners and be quiet? Miss Vivian did. I just learned her name today, through an internet search. My man had never been there until the night of our first date. We were seated by Miss Vivian, in the tiny room with only 5 tables. There was another couple in there too. They were much older than my parents. The man looked at me and said, “That’s the courtin’ table you’re sittin’ at! When you gonna marry her, boy? !” I don’t have a good memory, but that moment is locked into my brain forever. The man went on to say that he and his wife sat there for their first date and that they had been married for a long time now. He also said something along the lines of “She’s got that just-made-love-glow about her” … about me… which, by the way, was only an “IN-love glow”, I swear. We married in 2002, only 4 years later, after we had both graduated college. We adopted our first son in 2010 and gave birth to two more sons in 2012. We just celebrated our 11th wedding anniversary and have now been together for 15 years. He is my everything. Ruth’s Tea Room was the most romantic place on earth. It was in an old lady’s somewhat musty house, in the worst possible part of Winchester, with a boy I had met in a nursing home. It was the last first date of my life. 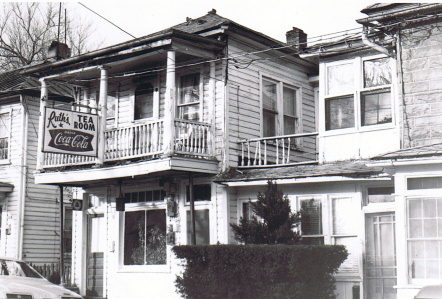 I have recently learned that Ruth’s Tea Room, located at 128 E. Cecil Street, in Winchester VA, was demolished in 2008. The entire block was razed. It is heartbreaking. I knew that it was a place nearing the end of its life in 1998, but it’s hard to accept that, even 15 years later, it’s really gone. A piece of history is gone. The Tea Room could have been in operation since 1915 (a 1990 article said it had been in operation for 75 years at that point). Also, the house itself was a piece of history, as it was first owned by the first freed slave in Winchester. Information about the place was suprisingly hard to find during an internet search. I did (somehow not surprisingly) find an entire webpage dedicated to the songs on the juke box at Ruth’s Tea Room: http://ruthstearoom.tumblr.com/. I found a facebook page called, “In Loving Memory of Ruth’s Tea Room”. I was moved to read the names of the members, which included names I haven’t seen since my middle-school yearbook. That page has 233 members! It is also where I found a picture of Miss Vivian, who I had thought was Ruth all these years. She is actually Ruth’s daughter. Seeing her face brought back some memories for me. The only history I could find was an old newspaper article written in 1990 by Joe Bageant, whose name I recognized immediately. He authored a book I own called “Deer Hunting with Jesus”, which is about povery and politics, as framed by Winchester, VA, which is Bageant’s hometown. I was surprised to see that he wrote about Ruth’s Tea Room, too! don’t know your name or where you live…but I live in Winchester next door to Miss “V”, around the corner from Cecil St. where the tearoom was. This Saturday (Oct. 26) a reunion is being held on the site where the tearoom stood. Oh my goodness! I have chills. That would mean the world to me if you were able to get a copy to Miss V for me. I can’t believe that she might finally know how important she was to me and my husband (and kids!) because of my blog and a perfect stranger! THANK YOU!! Thank you also for telling me about the reunion and the article in the paper. I am going to look that up right now. I really really wish I could come to the reunion, but unfortunately, we won’t be able to make the trip this Saturday. My heart is warmed to know that others care for Miss V and that site as much as I do. Much love. PS, Maggie, please let me know how the event goes!